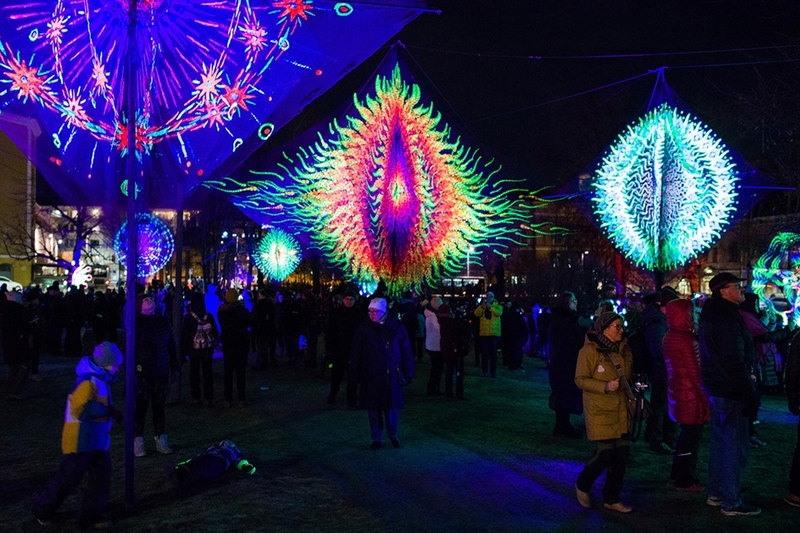 Lumo Light Festival Oulu gathered an impressive number of 150 000 visitors on its sixth year. Organised last weekend in Oulu, the sixth Lumo Light Festival was a huge success. The organisers were anticipating a growing audience but the total of 150 000 visitors surpassed all expectations. The previous attendance record was from last year when the festival attracted 60 000 goers. ”We thought there might be some congestion in the city centre, but we were overwhelmed by the huge number of people that actually came. The greatest thing was to see how people came to the centre specifically to see the light art on display. The grateful and positive feedback we have received has been heart-warming”, says Program Director Jarkko Halunen. This year the festival concentrated on one single weekend. ”It seemed to be the right decision, and the citizens enjoyed a lively city atmosphere with a lot of people out and about throughout the whole weekend. We were lucky to get good weather, too,” Producer Anna Lanas adds. Out of the three festival days, Saturday evening attracted the biggest audience. As an exception from previous years, Sunday was at least as popular as Friday. The most popular light pieces were Sturm Der Liebe, Initium and The Museum of the Moon. A Lumo stall serving warm drinks and snacks was introduced for the first time and greeted with pleasure by the audience. An abundance of festival-goers also visited the cafés and restaurants around town. Next year the Lumo Light Festival will be arranged between 22 and 24 November, and the focus will move from the city centre toward nature. The festival area will then include also the island of Linnansaari and Ainolanpuisto Park. In addition, next year the fringe programme of the festival will include a LUCI City Under Microscope event, which is part of the international process for Oulu’s bid to become the European Capital of Culture in 2026. ”This means we will be busy once again as the LUCI event will gather about 120 representatives from member organisations to Oulu. They will come here to explore our city lighting and the Lumo Light Festival as well as the lighting companies, education and research we have in the region,” Halunen explains. The global LUCI organisation has offices in Lyon and Seoul.